Right then ... sorry, left then, I'm off to the big union march at the MCG. If last year's shindig is anything to go by, it'll be laughs, love and labour movement. 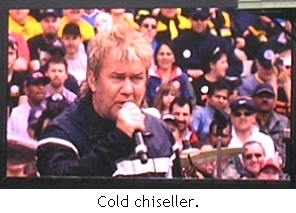 Jimmy Barnes is going to sing Working Class Man, too. He's a gem. If I bump into him I'll ask for that money he owes my family from his wife's failed "business" enterprise. Before he declared himself bankrupt and scarpered to France. Solidarity, frère. An absolute gem. Could you ask for the money he owes my mate's animation company as well? And then give him a little push as he's poised on the edge of the stage gargling his way through the second chorus. I'm sure he'd bounce. My crowd photo was taken about five minutes before Corinne Grant said the stadium was 3/4 full and that the turnout was, at various points, magnificent, astonishing, extraordinary, etc. The unions, of course, are talking up the numbers. The largest rally was in Melbourne, where unions estimated 60,000 people filed into the Melbourne Cricket Ground (MCG) - well down on ACTU promises to fill the 100,000-seat venue. Utter rubbish. 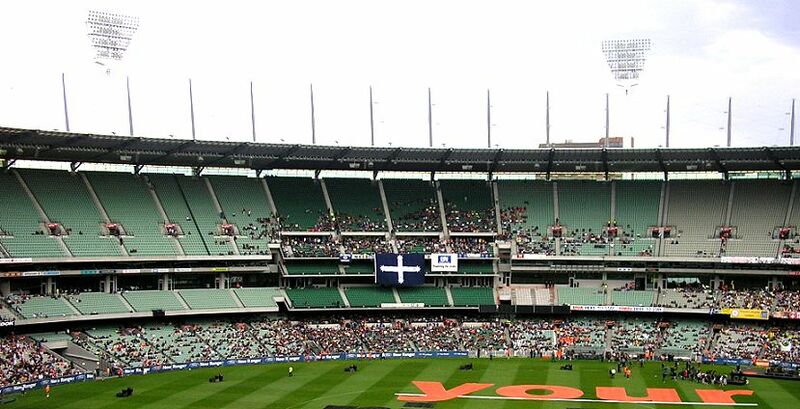 I've been to the MCG at least 500 times and they always have the crowd figure on the scoreboard. Today's crowd was probably somewhere around 35 to 40 thousand. 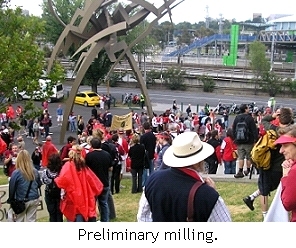 But Labor's industrial relations spokesman Stephen Smith, who was at the Melbourne rally this morning, said the MCG was about three-quarters full and two or three train lines were down, which did not help. ... which is bordering on a lie. But I'll give him the Lindsay Tanner "everyone exaggerates in politics" benefit of the doubt. Beth, the punters were reasonably happy to put up with Working Class Man. Afterall, as a gargle, it was "on message". But halfway through his next gargle, the punters started to leave. By the THIRD gargle they were streaming out. I wouldn't swear to it, but I'm sure I heard groans. Isn't that Pete Helliar impersonating Strauchany inpersonating Barnsey? Dunno what Kevin Andrews puts the crowd at, but I think I heard him mention off camera that it was 2,345 including passing pedestrians and their dogs. Now that you mention it, Ads. "Comedian" Gerry Connolly was also there doing his Queen shtick. Excruciatingly old-hat. Where was Ian Botham when you need a high profile walk-out? By the way, one of the speakers was called Grace Grace. How could they fill the ground, unless they let those scruffy union types in the MCC members reserve? You wouldn't see that happening in Adelaide. Is there a members in Adelaide? Barnsey - why punish people for losing a days pay and getting to the MCG. In that pic he looks like he is singing " I Wish I was Punk Rocker With Flowers In My Hair"
Did you yell out and request it? Nope, I requested Khe Sanh. Who doesn't love a good sing-a-long. Unions have declared the national day of protest against the WorkChoices laws a success, despite a smaller than expected turnout at the main rally in Melbourne. 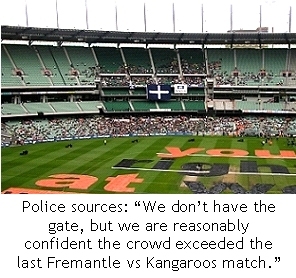 Rallies took place across the country and organisers had hoped to fill the MCG with a crowd of 80,000 people, but about half that number attended. By the way. Does anyone know which train lines were cancelled? When the initial announcement was made it was two lines, Frankston and Dandenong. This somehow became three lines but no one ever said what the third line was. 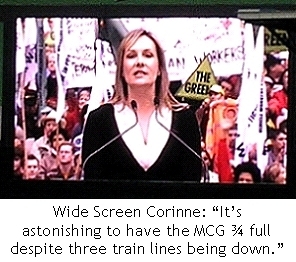 Dopey Corinne told the crowd John Howard would be the only one without a job. Double irony at least given last night's sayanara on ABCTV. Y'know, the show with all the values that wouldn't be interrupted for a Chief of Defence announcement about a military tragedy. I think the irony was lost on the crowd, Slatts. A more resonant theme among me and my fellow and fellowette chalkies textas was Kim Beazley clicking his fingers and grooving to Barnsey.